Not the .346 batting average that was the highest in the major leagues. Not the career-high 32 homers, either. But Betts drove in just 80 runs last year while spending almost all of his time as the leadoff hitter for the Red Sox. That seemed like a missed opportunity, so Cora is planning to bat Betts second this season and move Andrew Benintendi to leadoff. "If you play 162 games, you're going to come up 162 at-bats with nobody on," Cora said. Betts tied for the major-league lead with 129 runs scored, but he had the fewest at-bats with runners on base in baseball (among batters with at least 600 plate appearances). He is expected to get more batting behind Benintendi, whose .366 on-base percentage was third on the team behind Betts (.438) and J.D. Martinez (.402). It's one of the few changes Cora has planned for a team that won a franchise-record 108 games in his first season and its fourth World Series since 2004. After going 86 years without a championship, the Red Sox have won four this century. But they haven't won back-to-back World Series since 1915-16. Cora isn't pretending there's any other goal. "One thing about repeating," he said, dismissing popular theories of a championship "hangover" that prevents back-to-back winners. "I think it's who you have in the clubhouse and what they want to do." The last major league team to win two (or more) World Series in a row was the 1998-2000 New York Yankees. But Cora notes that since then, several other teams have come close enough to debunk the notion that there's some sort of hex. The Phillies made it back to the Series after winning it all in 2008, the Giants won three times in five years and the Los Angeles Dodgers have won back-to-back NL pennants. "We do believe we're going to do it," Cora said. "We've got a good team." The biggest offseason departure is closer Craig Kimbrel, who remained unsigned in this offseason's curious free agent market after turning down Boston's $17.9 million offer. Kimbrel saved 42 games and struck out 96 batters in 62 innings last year. He had six saves but also a 5.91 ERA during the postseason, and Cora went to starter Chris Sale to close out the Game 5 clincher of the World Series against the Los Angeles Dodgers. Reliable setup man Joe Kelly has signed with the Dodgers. In their place, the Red Sox are auditioning Matt Barnes, Heath Hembree, Ryan Brasier and Tyler Thornburg. (Another option, knuckleballer Steven Wright, has been suspended for 80 games after testing positive for human growth hormone). None has impressed this spring. Cora has said he might use more than one pitcher in the role, depending on matchups. The Red Sox have won three straight AL East titles, and they have done it with virtually the same roster. Last year, they signed J.D. Martinez during spring training, and then added Steve Pearce and Nathan Eovaldi midseason. Pearce, who was the World Series MVP, and Eovaldi, who pitched six innings of relief in the 18-inning Game 3, were both re-signed this offseason. Top prospect Michael Chavis hit four homers in 11 spring training games but already has been optioned to Triple-A. Bobby Dalbec, who also plays first and third base, could get the call if the team needs help at one of the infield corners. 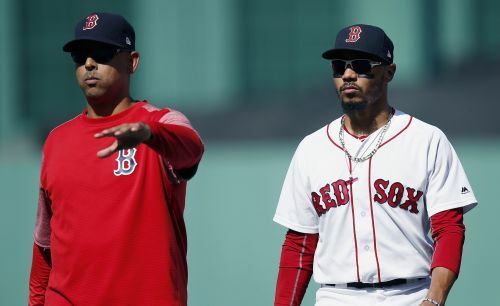 The Red Sox open the regular season at Seattle on March 28 and then complete their West Coast swing in Oakland and Arizona before returning to Boston to raise their championship flag at Fenway Park on April 9 against the Toronto Blue Jays.